Beauty Q&A: What’s the best fake tan? Q: I’ve always been weary of fake tan since I had a horrible experience a few years ago and ended up orange and streaky. Are there any tans you’d recommend to bronze up my pasty winter body? A: I’ve been inspired by the start of tan-tastic Dancing On Ice last weekend to bronze up. I always follow a few basic steps when tanning – I exfoliate, moisturise (particularly streaky hotspots like ankles, elbows and knees), then use a mitt for an even finish. Start at your feet and sweep upwards in long strokes, and always wait for 5-10 minutes before popping on your clothes. If you’re nervous about tanning, try an instant bronze. 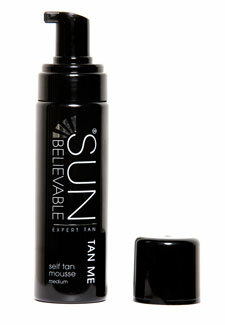 Rimmel Sunshimmer Instant Tan Make Up, £6, Boots, is great. I’ve just started using Fake Bake 60 Minutes Fake Tan Liquid, £24.95. It will transform your skin from pale and pasty to buff and bronze in an hour and I’m yet to spot a streak. For foolproof application, I rate Sun-Believable Self Tan Mousse, £30, The foam is tinted so you can see exactly where to apply it and blend. Happy tanning!